These greens are tender and almost even sweet from being gently cooked with onion. They're also spicy from a generous dose of ground ginger and black pepper. Hearty greens like kale and collard greens that can stand up to longer cooking times and benefit from soaking up strong flavors work particularly well in this dish. For an extra kick, try using mustard greens or turnips greens—their sharper flavor works really well here. If you want to use a quicker-cooking green like chard or spinach, simply reduce the cooking time after you add the greens to the pan (don't worry, it's noted when to stop with them in the recipe below). Note that these greens may seem like they're cooked for a long time. They are, in a way. In modern American cooking, greens are often simply wilted and served. Here, they are allowed to do more than just wilt. They're cooked so they release their liquid, which combines with the spices and aromatics to create a flavorful cooking liquid whose deliciousness the greens then simmer and soak in, absorbing all that extra-tasty goodness. Peel and chop the onion; peel and chop the garlic. Heat the oil or melt the butter in a large pot over medium heat (you'll need a big vessel to hold all the raw greens and be able to stir and combine them with the aromatics—they'll cook down to less than a sixth of their original volume). When the oil or butter is hot, add the onions, garlic, and salt and cook, stirring frequently, until the onion and garlic are softened and the onion is translucent, about 3 minutes. Add the ginger, turmeric, and pepper. Cook, stirring, until fragrant, about 1 minute. Add the greens, stir to combine, and reduce the heat to medium-low. Cook the greens, stirring them frequently, until they start to wilt, about 3 minutes. Cover the pot and cook until the greens are completely wilted and tender, about 5 minutes. 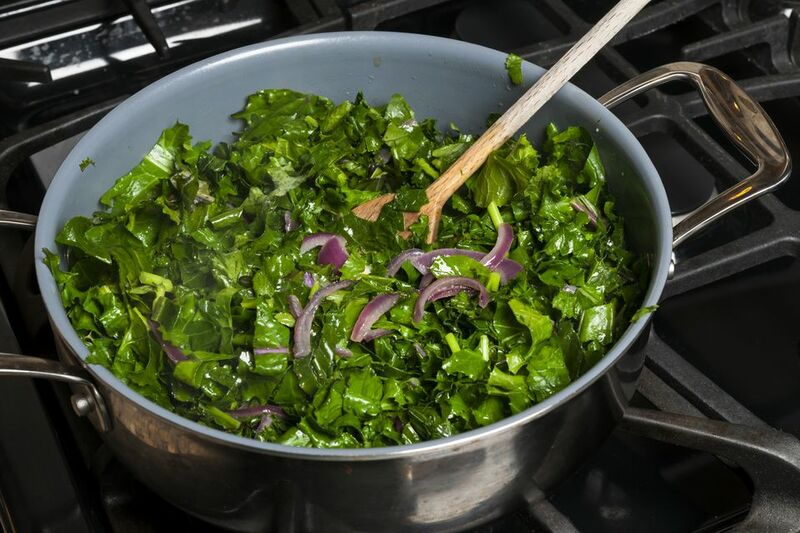 Quicker cooking greens like chard or spinach will be ready now. Heartier greens will become sweeter and even more deeply savory if you cover them and cook them an additional 15 minutes. Add a tablespoon or so of water to the pot if the greens start to stick to the pan.